Like many people, I like to understand certain phenomena. If we do not understand, we tend to compare these phenomena with ones we do understand, or think we understand. That comparison should help us with understanding the more complex phenomena. While this can be a strategy that helps us, it can distract us from the important aspects of these phenomena as well. This is always a pitfall when comparing apples and oranges. However, systems thinking is not just an apple or an orange, it can make sense to make use of systems thinking to try to understand tiny parts of a larger unit, in relation to other parts. A pile of sand is not a system. If one removes a sand particle, you’ve still got a pile of sand. However, a functioning car is a system. Remove the carburetor and you’ve no longer got a working car. The statement above is a somewhat simple example, that illustrates the complexity of a system. When you remove a lot of particles, the pile will collapse or even disappear. Translated to an organization, it becomes apparent what the problem with the comparison between systems and organizations is. Like with systems, every particle in an organization plays a role. It influences other parts. Maybe some particles can easily be removed, because they have little or no influence on other parts. The organization still works as expected, but we call it more efficient. Some particles are more difficult to replace, it has more influence on other parts and the organization will change as a result. Unlike with systems, there are no two particles alike when humans are involved. Therefore, the statement above doesn’t help me that much. The comparison is still a problem. What helps, is the statement of the same Carter McNamera when he explains why it is important to look at organizations as systems. The effect of this systems theory in management is that writers, educators, consultants, etc. are helping managers to look at organizations from a broader perspective. Systems theory has brought a new perspective for managers to interpret patterns and events in their organizations. In the past, managers typically took one part and focused on that. Then they moved all attention to another part. The problem was that an organization could, e.g., have wonderful departments that operate well by themselves but don’t integrate well together. Consequently, the organization suffers as a whole. This is helpful. Organizations are not systems, but it helps to look at an organization as if it were a system. Changing something in the organization always has influence on other areas in the organization. The comparison refers to complexity, both organizations as well as systems are complex. It can help to deal with the complexity of an organization. But then again, by looking at it as a system you should not make it a system, the processes that occur in organizations are not comparable to systems at all. The recent discussion on ‘Self-organization defined‘ where Jordan Frank from Traction Software commented on, triggered me to ask him some questions on the Teampage product in relation to self-organization. 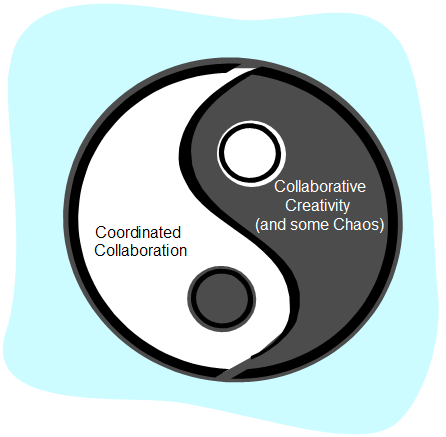 And as you can notice from the title of the blog, I’m interested in online collaborative spaces as well. Luckily, Jordan was so kind to answer my (many) questions. This post in an interpretation of some of the topics we discussed. When I asked Jordan to explain Traction in maximum 100 words, he said: “Traction TeamPage is an enterprise social software platform. While TeamPage offers the wiki, blog, tagging, discussion and document management features people seek in a social software or collaboration platform, TeamPage goes beyond traditional expectations to deliver critical functionality that is need by most, if not all, enterprises. Simple examples include social tagging across differently permissioned spaces, content moderation model, a view/query model that lets you easily organize pages around your use case or work objectives, and an audit trail that goes beyond edit history”. The video below explains some more. I don’t think Google Wave is the holy grail in this respect. I see it as a protocol for interaction and threading. While it greatly improves item level discussion versus email, it won’t necessarily span workspaces or offer anything close to the capabilities that TeamPage does. But we can use it to great advantage – much better for capturing synching external conversation and internal history. Should be fun to implement. We are making heavy use of Google Web Toolkit in our next interface. The system easily organizes around use cases rather than shaping the workspace based on the technology used to implement it. As one example, rather than having a ‘blog’ and a ‘wiki’, an HR space may have a ‘Policy’ section and a ‘Questions’ section. That space may also be moderated, which may be a requirement for the organization – otherwise a less capable wiki just wouldn’t be allowed. When we talk about self-organization, it is very important to set some constraints, or to remove them, all in order to let people ‘organize’ themselves easier. That’s what the consensus on the ‘Self-organization defined’ topic is. Translated to software or online collaborative spaces, I asked Jordan how this can be done in Teampage. You can set constraints by providing templates, a starting set of labels (tags) and sections. Sections are like portlets in a space. A Project management team may have sections for meeting notes and issues, for example. Each section may be associated with article/page template. So, a meeting agenda template may launch from a meeting notes page section. If we talk at having freedom for the users of the software, there is any freedom you would expect in any other blog/wiki/tagging environment. The starting sections and labels in a template are just that, a starting point. A person in charge of the space can enforce some controls, or leave it fairly open. In my context, it’s enabling individuals to organize themselves and their content without constraints that they don’t want. This acknowledges a need for constraints that may be helpful. This acknowledges that an organizational structure (be it top-down or matrix) may be necessary or simply helpful. Key is to make use of existing organizational structures, and play with constraints. Keep them, make them or bypass them where necessary. Structures can always change, and Jordan explains this with a sports analogy, when I asked him about his earlier statement that self-organization often works better when there is some starting structure. What did he mean here? I mean that a blank white page is very intimidating, and doesn’t necessarily assist team play. To use a sports analogy, Zone defense is a bit less structured than man-on-man. Zone defense requires constant adjustments and on-field co-ordination. So, there is a structure indicating an area a player defends at the start, but the structure may change as a play is executed and the players self-organize to adapt. Out of 10 types of activities, a project team may discover that their most pressing need is to document requirements and discuss issues. You may structure a space, initially, around these two use cases and you may go as far as gaining management backing (or mandate). At any time, individuals may go beyond the starting structure by posting other types of content, but they start by creating some gravity and a consistent process for documenting requirements and resolving issues. These principles are very open ended, and the method claims that this is why it is so effective. There is no need to prepare upfront, just a theme is announced. When practiced, people gather is concentric circles, depending on the size of the group. There is just one facilitator that enables the session can take place. People can identify issues or opportunities related to the theme and can apply to discuss these topics. Many groups form, and when you feel you can’t contribute you can just leave and join another group. These discussions can last for a few hours. Afterwards these groups can continue online. There are some online solutions available as well, such as OpenSpace-Online, but there probably are more. What can we learn from open space? Well, personally a lot. It’s quite new for me so I have to dig deep into this. But I can see opportunities when we take the problem statement into account. This method definitely supports self-organization, and organizations seem a very realistic target. But the key to success are as always people and their behaviour. The four principles seem quite easy to understand, but when working with large groups, other factors that our counter-productive will play a role as well. Does anyone know of people that have some experience with this method or have experience themselves? You are very much invited to let me know and help me learn about this method.